Yes, location definitely can affect the results of your solar cooking. Although this is not the biggest factor, it does determine how often and when one can solar cook, to a fair degree. Note:The following information will probably apply more to the circumstances and locations of those who wish to solar cook in the more northern locations of the world, since those peoples nearest the equator are not affected in the same way as those living in higher latitudes. Of course the further north you go in the northern hemisphere the greater the "angle" of the suns rays towards the earth; meaning less intensity, and the same applies in the reverse in the southern hemisphere. 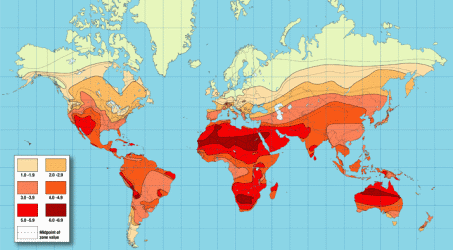 In other words, the more direct the sun's rays are; the better the cooking result, which becomes an even greater factor in the wintertime.The following map indicates where the suns rays are more direct, more often throughout the year, making these locations "ideal" for frequent solar cooking. The angle of the sun's rays at a given time of year or day is one reason why many solar cookers will adjust or compensate for varying sun angles, and especially so in the wintertime. This is accomplished by tilting or inclining their solar cookers on an angle that will allow for the suns rays to strike the ovens and its reflectors in a more direct or straight line. Some cookers are designed with this compensation factor in mind while others are not, but often all that is needed to achieve this effect is to incline or tilt the box or panel/funnel cooker in a way to receive more direct rays from the sun. This can be a little tricky though with some styles of cookers, because you are then tilting or inclining the cook pot along with the food inside, which can result in spills. Many panel/funnel cookers are not near as effective in the wintertime due to the fact that they do not allow for increased compensating angles, because of possibilities of tipping or dumping the food onto the ground by using too much of an incline. There are a number of box cookers that are specifically designed for the need of compensated inclines, both commercially built and homemade designs. Two such examples from the commercial market would be the popular Global Sun Oven and the SOS Sport oven. * Parabolic solar cookers usually will not have the same problems of obtaining the proper and ideal cooking angles, as do box and panel cookers, since most are designed to be continually adjusted for maximum cooking potential. Due to the designs and the science involved in the making of these particular cookers; Parabolas must be adjusted more frequently though, no matter what time of the year or the geographical location. Some people will build or buy a variety of solar cookers in order to compensate for the different factors that can affect solar cooking throughout the year in their particular area.They will use panel/funnel cookers, along with their box cookers more often in the summer time, and then switch almost primarily to box or parabolic cookers in the winter. Many solar cooks will have or own a variety of cookers simply for the added ability to cook larger quantities and varieties of food than could be accomplished with just one cooker. Some people still wonder if it is possible to cook outside when there is snow on the ground and when the temperatures are very low. In some of the northern latitudes of the world, wintertime cooking will be curtailed or eliminated all together due mostly to the weather.But if there is sunshine, it is possible to still cook even if the ambient temperature is quite low. Cooking times and durations are usually quite short though. The ambient, or outside temperature can affect cooking times and results somewhat, but if you have a well built solar cooker or oven you can generally offset this condition.The tighter and better insulated your solar oven is the more easily it will overcome ambient conditions. With parabolic cookers though, the key is in the constant attention to and adjustment of the parabola, this being more true in the winter and at more northern geographical latitudes, say for example; in Canada. In general, Latitude is a more significant factor than ambient temperature in regards to overall frequency and practical ability to solar cook. 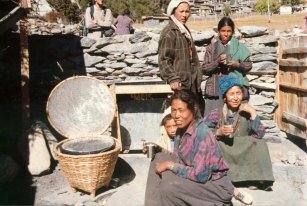 This is evident in the example of solar cooker users in the countries of Nepal and Tibet. At first glance one would not consider these two countries to be ideal solar cooking locations, especially with such high, cold, and at times; stormy elevations being so predominant throughout the geographical features of the two countries. But when you understand that both countries lie at about the 30th geographical parallel or lower (which is lower than most of the USA) you can understand how they enjoy relatively longer periods of direct rays from the sun than do many other areas of this planet.And the higher elevations allow them a greater abundance of unfiltered, or rather less filtered, rays from the sun, giving greater energy intensity to the UV rays. The use of solar cookers in both of the above mentioned countries has continued to spread since its introduction a few years back, allowing the poor a means to cook without the need to rely on extremely scarce bio fuel resources. Of course, Sunny days make for better solar cooking conditions, and many places throughout the world and throughout our own USA do receive a sufficient amount of sunny days to allow for quite a few ideal solar cooking opportunities. I have friends, colleagues and acquaintences that solar cook in such diverse places as New Hampshire and Connecticut, Seattle, Washington and Portland, Oregon, Great Britain and much of Europe. And of course, I understand that they may not have as many opportunities to solar cook as some of us who live in the sunnier desert places, but every chance they get they do take the opportunity to use their solar cookers. My associates in some coastal areas of California, Florida, South Carolina, Georgia and other areas back east have issues with muggy and cloudy weather during some parts of the summer, but that is not the case all summer long and at other times of the year they will have great solar cooking conditions when the heat has subsided a bit. Every where has the means and conditions to allow for solar cooking to some degree or another. We just need to take advantage of those opportunities. Overall, using solar energy to cook has proven to be quiet feasible in the greater majority of the world's populated areas; whether it be in emerging economies and societies, which stand to benefit most from solar cooking, or whether it be in those already emerged societies such as Europe and the US. If you have developed an interest about learning how solar cooking can benefit you personally and whether it can be done in your area of the world please visit our Solar Cooking Classes and Demonstration locator page. Is the desert southwest too hot for solar cookers? Do they wear out more quickly?